This has the right forms of B6, B12, Folate! 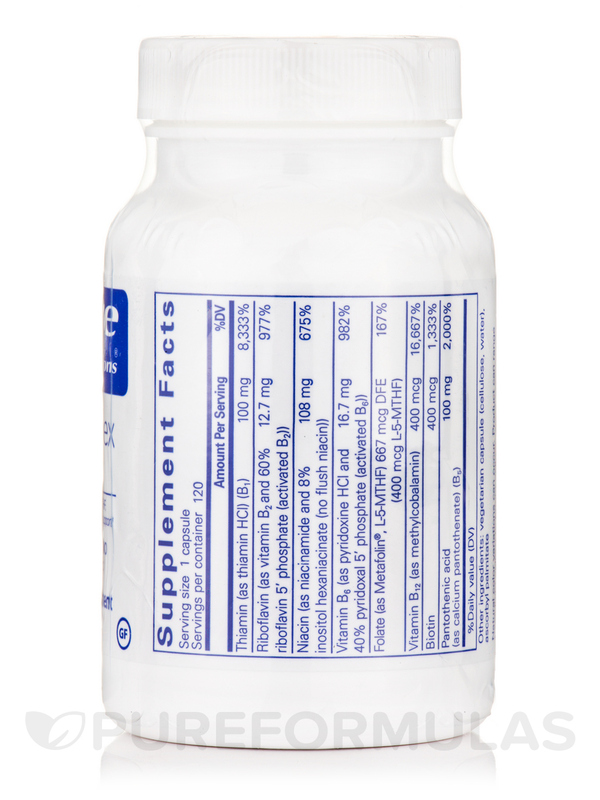 This B-Complex Plus has the right assortment of B vitamins. B-Complex Plus by Pure Encapsulations gave me lots of energy! 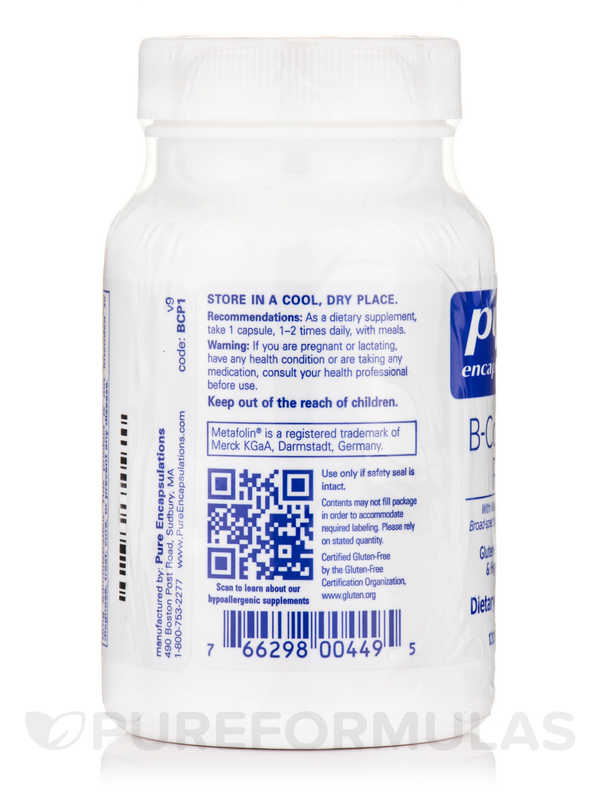 B-Complex Plus capsules from Pure Encapsulations is a combination of B vitamins‚ including vitamins B1‚ B2‚ B3‚ B5‚ B6‚ B12‚ biotin and folate. 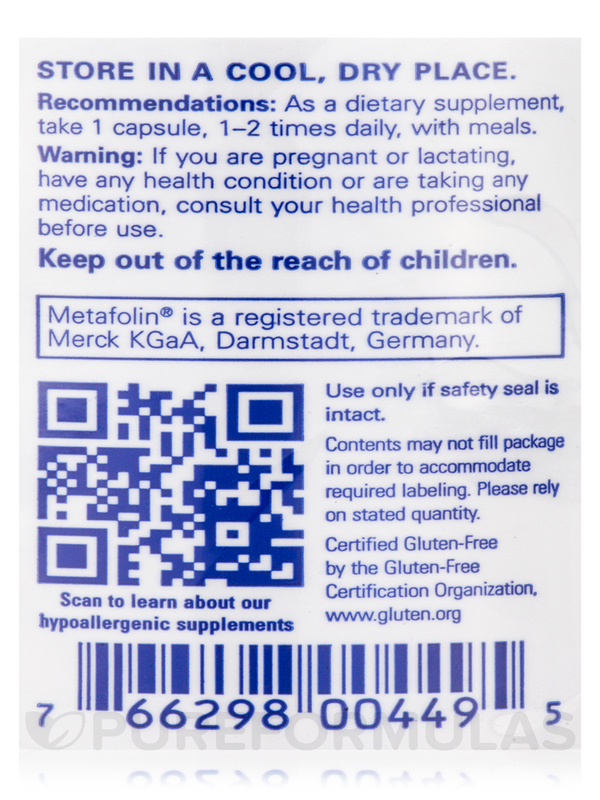 With so many different vitamins‚ B-Complex Plus can be taken for a number of reasons. The B complex vitamins are known mostly for their role in converting the food you eat into energy as well as keeping your metabolic rate at a healthy level. Here are some other reasons why B vitamins are so important. B1 is a key contributor in the process your body takes to convert the food you eat into the energy you need to function. B2 works as an antioxidant by fighting against free radicals in your body and assists in the production of red blood cells. 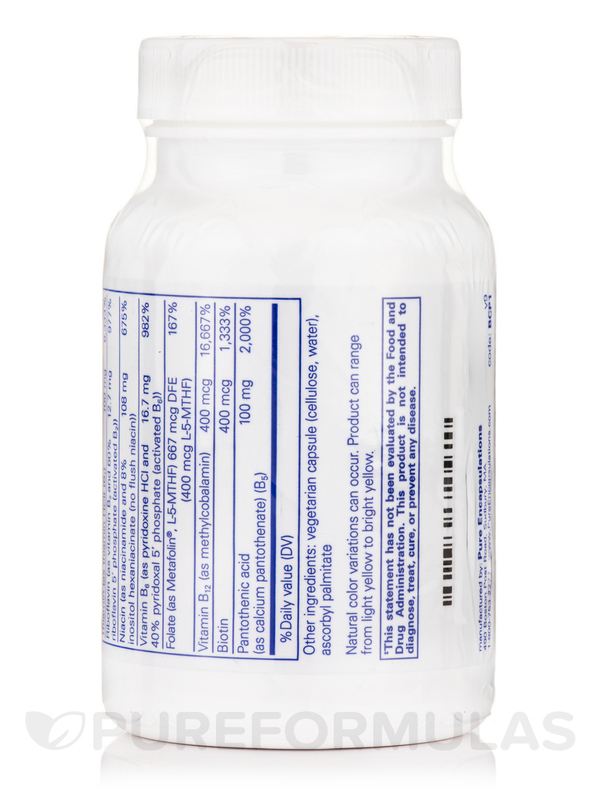 B3 and B5 can support cardiovascular health and play a role in the production of neurotransmitters. B6 promotes nervous system health‚ neurotransmitters and some research has even shown it to limit menstrual discomfort. B12 plays a role in DNA replication‚ metabolism and nerve cell activity. Notice: Natural color variations can occur. Product can range from light yellow to bright yellow. Contents may not fill package in order to accommodate required labeling. Please rely on stated quantity. This is the right B-complex! First of all, I LOVE Pure Encapsulations products! This B-12 complex has helped me so much with my energy level. Also, it is quite helpful during that dreaded time of month when one might be experiencing cramps, moodiness and all around discomfort. This B vitamin is a very good vitamin, small size with great quality! Great quality & small swallowable size. A book I was reading recommended this product to me. I didn't have any problems while taking it. My doctor did muscle testing on me and said she thought my body no longer needed it. That's the only reason I no longer take it. 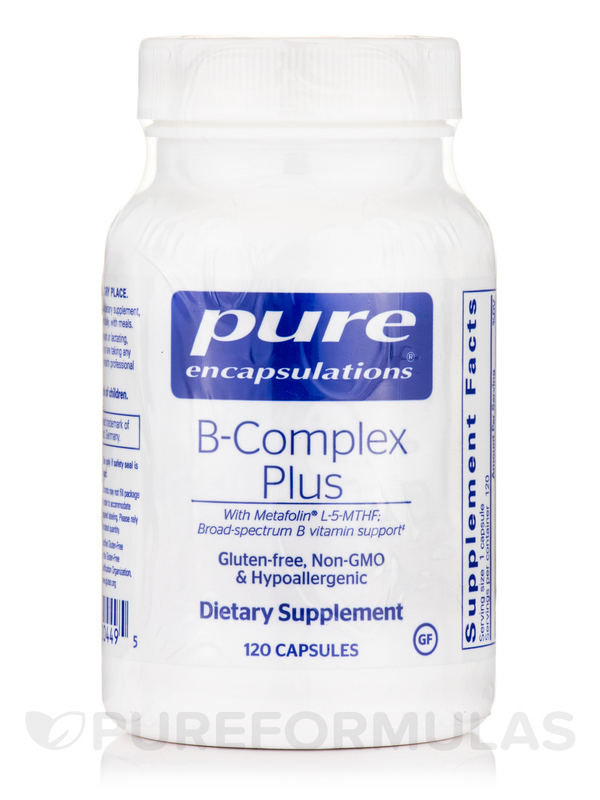 This B-Complex Plus by Pure Encapsulations is my everyday life saver! Can't go without it. 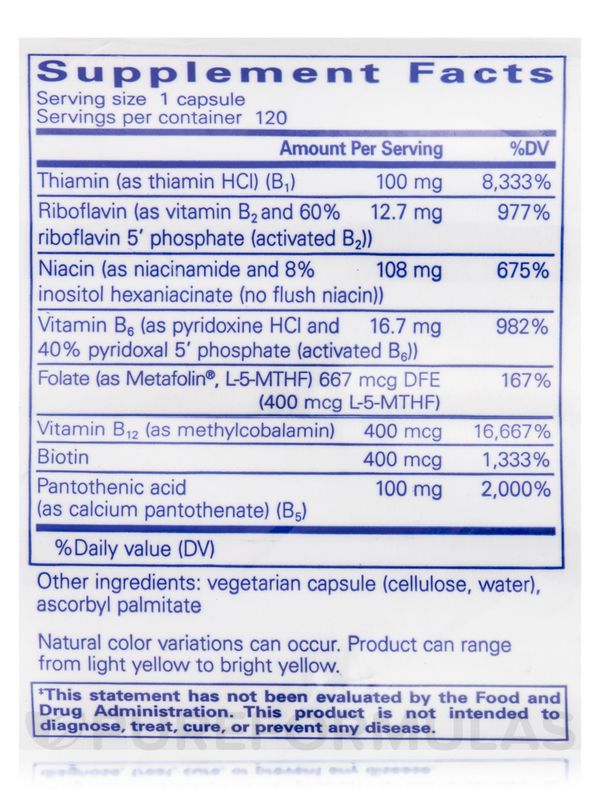 It also includes thiamine. 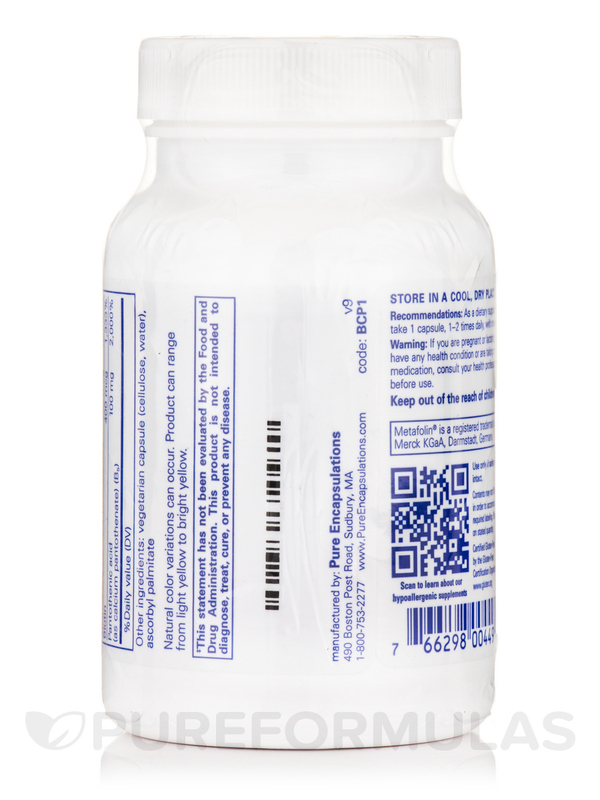 As seniors B-Complex Plus by Pure Encapsulations is helpful in our daily activity. Small and easy to take, and really works. I experience no flushing with this B-Complex Plus by Pure Encapsulations. Love the pure encapsulations products. My mom had a light stroke in Feb. and is well except she can't regain all her energy back and some slight memory fog Do you recommend the B complex or something else? What happened to PE1480 (P5P 50) ? Has something else took it's place? Indicates activated B6.......... ??? Hello Bobby,Thank you for choosing PureFormulas.com.The product PE1480 is indeed in stock, please enter the item number into the search bar.Hope you have a happy and healthy day.